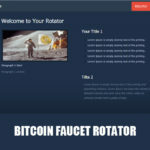 Bitcoin faucet faucetsystem script is the official faucet script of faucetsystem.com. It is a microwallet like faucethub but their micro wallet consist only of bitcoin. Faucetsystem bitcoin faucet security is well secured. It has builtin anti-bot protection. It open very fast on browsers and a-ads let you withdraw your bitcoin satoshi into your faucetsystem account without any fee and the minimum withdrawal is 0.00000001. So if your going to apply to a-ads as a publisher you can directly fund your account everyday through the earnings of your publisher account in a-ads. Before a visitor can claim there are 3 pages he needs to access first. Every page have advertising placements you can use to place your ads. It is very convenient for publishers. 2. You will need a hosting provider you can get it Here. We have a 60% discount in hostgator, you only need to pay starting at $3.98 per month. If you want other hosting provider you can look Here. 1. Create an account in faucetsystem. Then click create new faucet to get and API key. You will need an API key that comes with your account. 2. Download the faucet script and unzip downloaded archive. Then unzip it to a folder in your desktop. 3. Go to your cpanel and create a MySQL database. 4-b. Click the database that you created and click import. 4-c. Click browse and look for your extracted file and click dump.sql, then scroll down and click the Go button. 5. Go to your file manager and right click the config.php so you can edit it. 6. Upload all files from the directory or to your domain name. You should have a list of files like the ones shown in the image above. 7. To grant the Apache web server write permissions for the “tmp” directory. Right click on the tmp folder and check all the permission. 8. Open your website and go to Admin Zone (default login: admin, default password: admin) at the top right corner of your screen. It is a icon with a pad lock image. After you log in get an API in your faucetsystem account. You need to create a faucet to get an API key. Enter the values that you want… price, time of claim, captcha keys. Don’t forget to change your faucet’s admin username and password in the Admin Zone. Here is the link to the article and it is created by alamin.